She shot to stardom in a computer game, then came the movie, so there was no reason why Lara Croft could not feature in a slot game and she now has in Microgaming's Tombraider. 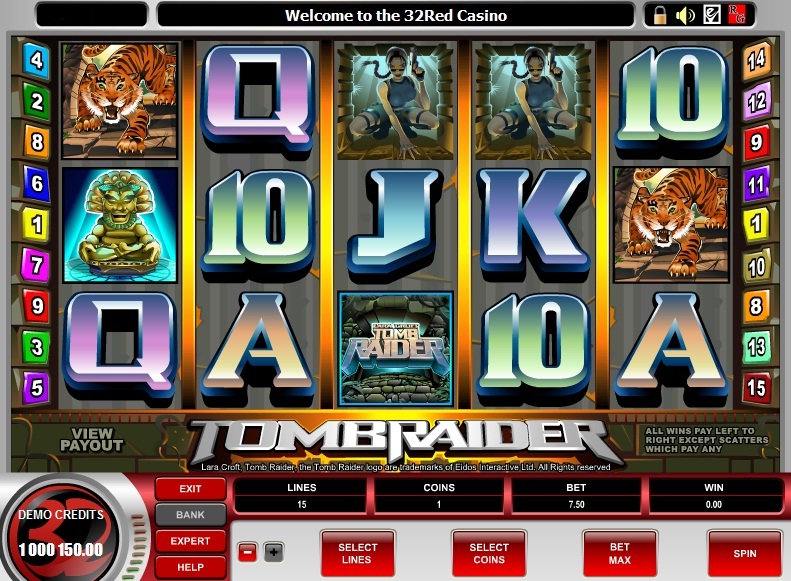 This 15 payline online video slot sees Lara Croft seek out secret treasures in a bid to reward players of the game, unfortunately she doesn't always find them. If you played Microgaming slots before Federal changes in US online gaming laws then there is a good chance you have played this game, as it is one of their older titles. Unfortunately Microgaming slots are not currently available to US players for the time being. There has since been a 25 line follow up called Tombraider 2 - Secret of the Sword, which is a much more modern looking game. However, what the original version lacks graphically it makes up in rewards as I will explain. Tombraider slot comes with two bonus rounds, which are completely separate in the way they deliver wins. The first is the Idol bonus, triggered by getting 3 or more idol figures on any of the reels. You then get a new screen which allows you to pick out 3 of the same figures to reveal a bonus. 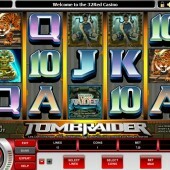 A more rewarding bonus is the free spins bonus, which starts when you see 3 or more Lara scatters on any of the reels. You are instantly awarded 12 free spins at 3x multiplier. This bonus can be retriggered at any time by getting 3 or more scatters again. This might explain why the RTP (payout percentage) for this game is very good at 96%. Game console-themed slots like Tombraider have become quite popular over several of the main software companies and there are a few very good ones out now including Hitman slot and Call of Duty 4 slot, alothough both struggle to match up to Lara in Tombraider.